Authorized by Congress in 1996 and first issued in 1997, the American Eagle Platinum coin is one of the world’s most popular annual bullion releases. With its bold designs, high metal purity and legal-tender status, it’s easy to see why. And now the 2019 Platinum Eagles have taken flight and are ready to soar into your collection! Struck in a full troy ounce of 99.95% pure platinum, these $100 legal-tender bullion coins feature the unmistakable talents of John Mercanti, the U.S. Mint’s 12th Chief Engraver and the designer of more coins in American history than any other person. His stunning close-up of the Statue of Liberty’s stoic face on the coin’s obverse is perfectly balanced by sculptor-engraver Thomas D. Rogers reverse design of an eagle soaring high against the background of a sun rising over America. Your 2019 Platinum American Eagle has been graded by the Numismatic Guaranty Corporation (NGC) as being in flawless Mint State-69 (MS69) condition, a distinction that means your almost-flawless coin will showcase an impressive full strike and indistinguishable imperfections – well above and beyond the quality of the vast majority of coins in the series. This is a remarkable grade when you consider the Mint does not incorporate any special handling with its bullion coins, being more concerned with requirements for weight and size rather than quality. 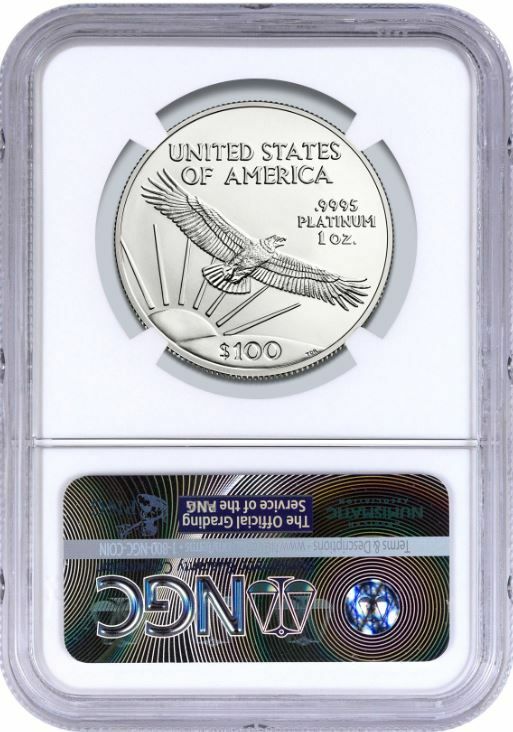 In addition, NGC has graded your Platinum American Eagle to be a to be a First Releases (FR) coin, meaning that it was among the first struck by the mint and was verified within the first 30 days of issue. Collectors seek out these coins because they are produced with new dies and considered to have sharper strikes and deeper mirrors than those that are struck later. Also, the population of coins labeled First Releases is only a fraction of the total mintage. It’s also important tot note that platinum is one of the world’s most precious and coveted metals. While gold has long been the standard for currencies around the world, platinum is actually 15 times rarer than gold. What’s more, 90% of the world’s platinum supply comes from just four mines – three in South Africa and one in Russia. Collectors and platinum bullion buyers alike will all be trying to elbow each out of the way other to get the lion’s share of these coins. But if you want to get one of these platinum beauties you won’t be able to go to the U.S. Mint for it. That’s because these bullion coins are sold only to authorized resellers like GovMint.com! Don’t wait; click one – or several – 2019 Platinum American Eagles to your cart right now! CLASSIC DESIGN FROM A MASTER ENGRAVER – The close-up of Lady Liberty on this coin’s obverse is a masterpiece from John Mercanti, the U.S. Mint’s 12th Chief Engraver. The reverse featuring a soaring eagle in flight along with the denomination and the metal’s weight and purity was designed by Thomas D, Rogers. STRUCK IN PURE PLATINUM – Each 2019 Platinum American Eagle is struck in one troy ounce of 99.95% pure platinum. LEGAL TENDER – These 2019 Platinum American Eagles are $100 legal tender. GRADED IN NEAR-PERFECT UNCIRCULATED CONDITION – Your 2019 Platinum American Eagle has been graded by the Numismatic Guaranty Corporation (NGC) as being in near-perfect Mint State-69 (MS69) condition. 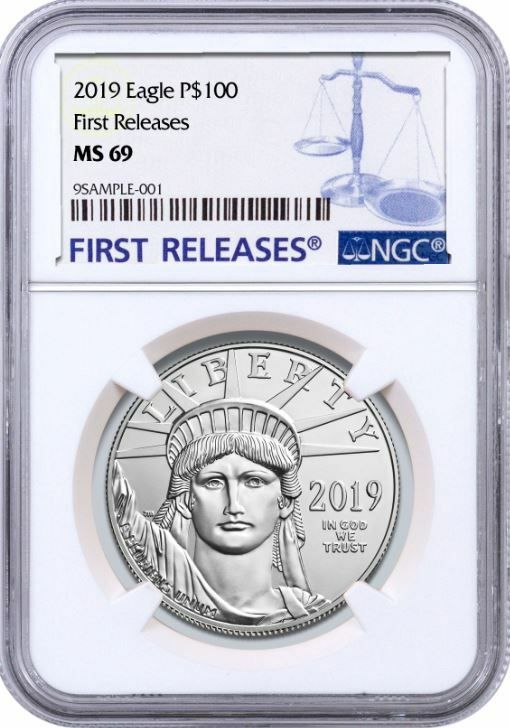 KEY FIRST RELEASES CERTIFICATION – NGC has graded your 2019 Platinum American Eagle to be a First Releases (FR) coin, a designation that means your coin was received by NGC or an NGC-approved depository within the first 30 days of the coin’s release. Now in its second decade, America’s Platinum Eagle is a great choice for collectors and bullion stackers alike. Order yours today!